Cardiac output is the amount of blood pumped by the heart per minute. It is the product of the heart rate, which is the number of beats per minute, and the stroke volume, which is amount pumped per beat. CO = HR X SV. The cardiac output is usually expressed in liters/minute. Conditions like myocardial infarction, hypertension, valvular heart disease, congenital heart disease, cardiomyopathy, heart failure, pulmonary disease, arrhythmias, drug effects, fluid overload, decrease fluid volume, and electrolyte imbalance are considered the common causes of Decreased Cardiac Output. The aging process causes reduced compliance of the ventricles, which makes the older population at high risk of developing cardiac problems. In an aging population with steadfast high prevalence of cardiovascular disease (CVD), the health care system is handling a growing challenge to efficiently care for these patients. Patients may be managed in an acute care, ambulatory care, or home care setting. Patient demonstrates adequate cardiac output as evidenced by blood pressure and pulse rate and rhythm within normal parameters for patient; strong peripheral pulses; and an ability to tolerate activity without symptoms of dyspnea, syncope, or chest pain. Patient exhibits warm, dry skin, eupnea with absence of pulmonary crackles. Patient remains free of side effects from the medications used to achieve adequate cardiac output. Patient explains actions and precautions to take for cardiac disease. 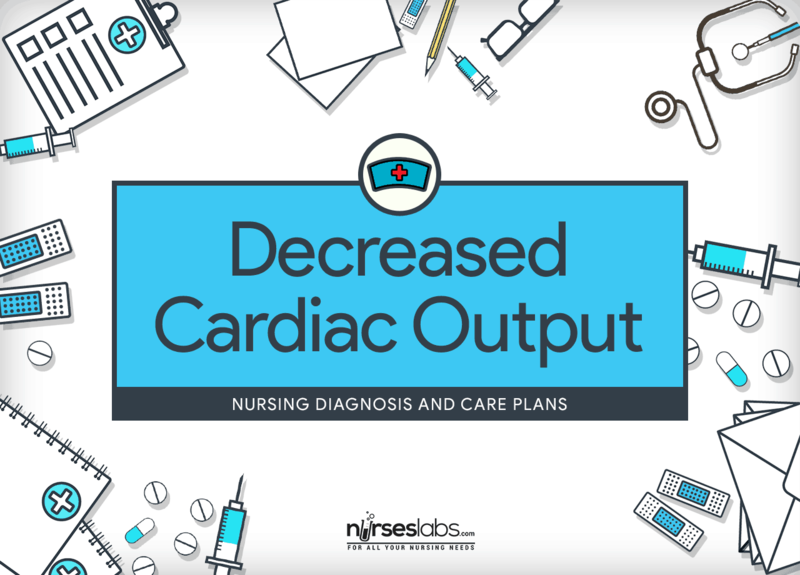 Assessment is required in order to distinguish possible problems that may have lead to Decreased Cardiac Output as well as name any episode that may happen during nursing care. Note skin color, temperature, and moisture. Cold, clammy, and pale skin is secondary to compensatory increase in sympathetic nervous system stimulation and low cardiac output and oxygen desaturation. Check for any alterations in level of consciousness. Decreased cerebral perfusion and hypoxia are reflected in irritability, restlessness, and difficulty concentrating. Aged patients are particularly susceptible to reduced perfusion. Assess heart rate and blood pressure. Most patients have compensatory tachycardia and significantly low blood pressure in response to reduced cardiac output. Check for peripheral pulses, including capillary refill. Weak pulses are present in reduced stroke volume and cardiac output. Capillary refill is sometimes slow or absent. Inspect fluid balance and weight gain. Weigh patient regularly prior to breakfast. Check for pedal and sacral edema. Compromised regulatory mechanisms may result in fluid and sodium retention. Body weight is a more sensitive indicator of fluid or sodium retention than intake and output. Record urine output. Determine how often the patient urinates. The renal system counterbalances low BP by retaining water. Oliguria is a classic sign of decreased renal perfusion. Assess heart sounds for gallops (S3, S4). S3 indicates reduced left ventricular ejection and is a class sign of left ventricular failure. S4 occurs with reduced compliance of the left ventricle, which impairs diastolic filling. Note respiratory rate, rhythm, and breath sounds. Identify any presence of paroxysmal nocturnal dyspnea (PND) or orthopnea. Shallow, rapid respirations are characteristics of decreased cardiac output. Crackles indicate fluid buildup secondary to impaired left ventricular emptying. Assess beta-type natriuretic peptide (BNP). BNP is elevated with increasing filling pressure and volume in left ventricle. It aids in differentiating cardiac from noncardiac cause of dyspnea. If hemodynamic monitoring is in place, assess CVP, pulmonary artery diastolic pressure (PADP), pulmonary capillary wedge pressure (PCWP), as well as cardiac output and cardiac index. CVP provides information on filling pressures of the right side of the heart; PADP and PCWP reflect left-sided fluid volumes. Cardiac output provides an objective number to guide therapy. Assess oxygen saturation with pulse oximetry both at rest and during and after ambulation. An alteration in oxygen saturation is one of the earliest signs of reduced cardiac output. Hypoxemia is common, especially with activity. Check symptoms for chest pain. Low cardiac output can further decrease myocardial perfusion, resulting in chest pain. Assess for reports of fatigue and reduced activity tolerance. Fatigue and exertional dyspnea are common problems with low cardiac output states. Close monitoring of the patient’s response serves as a guide for optimal progression of activity. Monitor electrocardiogram (ECG) for rate, rhythm, and ectopy. Cardiac dysrhythmias may occur from low perfusion, acidosis, or hypoxia. Tachycardia, bradycardia, and ectopic beats can further compromise cardiac output. Older patients are especially sensitive to the loss of atrial kick in atrial fibrillation. Ascertain contributing factors so an appropriate care plan can be initiated. Specific causes guide treatment. Assess patient for understanding and compliance with medical regimen, including medications, activity level, and diet. This promotes cooperation of patient in his or her own medical situation. Identify emergency plan, including use of CPR. Decreased cardiac output can be life threatening. Record intake and output. If patient is acutely ill, measure hourly urine output and note decreases in output. Reduced cardiac output results in reduced perfusion of the kidneys, with a resulting decrease in urine output. For patients with increased preload, limit fluids and sodium as ordered. Fluid restriction decreases extracellular fluid volume and reduces demands on the heart. Closely monitor fluid intake including IV lines. Maintain fluid restriction if ordered. In patients with decreased cardiac output, poorly functioning ventricles may not tolerate increased fluid volumes. Auscultate heart sounds; note rate, rhythm, presence of S3, S4, and lung sounds. The new onset of a gallop rhythm, tachycardia, and fine crackles in lung bases can indicate onset of heart failure. If patient develops pulmonary edema, there will be coarse crackles on inspiration and severe dyspnea. Closely monitor for symptoms of heart failure and decreased cardiac output, including diminished quality of peripheral pulses, cold and clammy skin and extremities, increased respiratory rate, presence of paroxysmal nocturnal dyspnea or orthopnea, increased heart rate, neck vein distention, decreased level of consciousness, and presence of edema. As these symptoms of heart failure progress, cardiac output declines. Note chest pain. Identify location, radiation, severity, quality, duration, associated manifestations such as nausea, and precipitating and relieving factors. Chest pain/discomfort is generally suggestive of an inadequate blood supply to the heart, which can compromise cardiac output. Patients with heart failure can continue to have chest pain with angina or can reinfarct. If chest pain is present, have patient lie down, monitor cardiac rhythm, give oxygen, run a strip, medicate for pain, and notify the physician. These actions can increase oxygen delivery to the coronary arteries and improve patient prognosis. Place on cardiac monitor; monitor for dysrhythmias, especially atrial fibrillation. Atrial fibrillation is common in heart failure. Examine laboratory data, especially arterial blood gases and electrolytes, including potassium. Patient may be receiving cardiac glycosides and the potential for toxicity is greater with hypokalemia; hypokalemia is common in heart patients because of diuretic use. Monitor laboratory tests such as complete blood count, sodium level, and serum creatinine. Routine blood work can provide insight into the etiology of heart failure and extent of decompensation. A low serum sodium level often is observed with advanced heart failure and can be a poor prognostic sign. Serum creatinine levels will elevate in patients with severe heart failure because of decreased perfusion to the kidneys. Creatinine may also elevate because of ACE inhibitors. Administer medications as prescribed, noting side effects and toxicity. Depending on etiological factors, common medications include digitalis therapy, diuretics, vasodilator therapy, antidysrhythmics, angiotensin-converting enzyme inhibitors, and inotropic agents. Review results of EKG and chest Xray. EKG can reveal previous MI, or evidence of left ventricular hypertrophy, indicating aortic stenosis or chronic systemic hypertension. Xray may provide information on pulmonary edema, pleural effusions, or enlarged cardiac silhouette found in dilated cardiomyopathy or large pericardial effusion. Position patient in semi-Fowler’s to high-Fowler’s. Upright position is recommended to reduce preload and ventricular filling when fluid overload is the cause. For hypovolemia, supine positioning increases venous return and promotes diuresis. Administer oxygen therapy as prescribed. The failing heart may not be able to respond to increased oxygen demands. Oxygen saturation need to be greater than 90%. During acute events, ensure patient remains on bed rest or maintains activity level that does not compromise cardiac output. In severe heart failure, restriction of activity often facilitates temporary recompensation. Monitor blood pressure, pulse, and condition before administering cardiac medications such as angiotensin converting enzyme (ACE) inhibitors, digoxin, and beta-blockers such as carvedilol. Notify physician if heart rate or blood pressure is low before holding medications. It is necessary for the nurse to assess how well the patient is tolerating current medications before administering cardiac medications; do not hold medications without physician input. The physician may decide to have medications administered even though the blood pressure or pulse rate has lowered. Monitor bowel function. Provide stool softeners as ordered. Tell patient to avoid straining when defecating. Decreased activity can cause constipation. Straining when defecating that results in the Valsalva maneuver can lead to dysrhythmia, decreased cardiac function, and sometimes death. Advise patient to use a commode or urinal for toileting and avoid use of a bedpan. Getting out of bed to use a commode or urinal does not stress the heart any more than staying in bed to toilet. In addition, getting the patient out of bed minimizes complications of immobility and is often preferred by the patient. Apply music therapy to decrease anxiety and improve cardiac function. Music has been shown to reduce heart rate, blood pressure, anxiety, and cardiac complications. Associate patient to heart failure program or cardiac rehabilitation program for education, evaluation, and guided support to increase activity and rebuild life. A thoroughly monitored exercise program can improve both functional capacity, and left ventricular function. Educate family and patient about the disease process, complications of disease process, information on medications, need for weighing daily, and when it is appropriate to call doctor. Early recognition of symptoms facilitates early problem solving and prompt treatment. Aid family adapt daily living patterns to establish life changes that will maintain improved cardiac functioning in the patient. Transition to the home setting can cause risk factors such as inappropriate diet to reemerge. Explain importance of smoking cessation and avoidance of alcohol intake. Smoking cessation advice and counsel given by nurses can be effective, and should be available to patients to help stop smoking. Educate patient the need for and how to incorporate lifestyle changes. Psychoeducational programs including information on stress management and health education have been shown to reduce long term mortality and recurrence of myocardial infarction in heart patients.